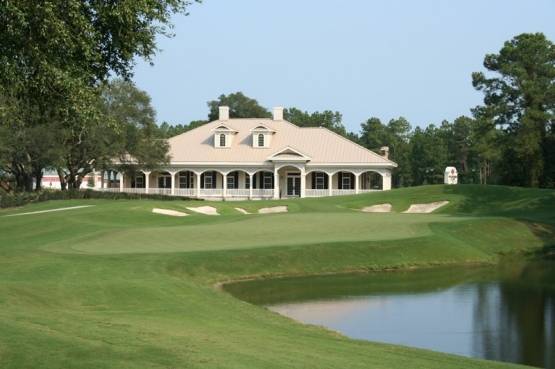 The Founders Club is located in beautiful Pawleys Island, S.C. which is America’s oldest seaside resort. The area is steeped in lowcountry tradition and southern charm. This Myrtle Beach golf course reflects all of these qualities. In 1966 Gene Hamm designed Sea Gull Golf Club which made it the fourth oldest course on the Grand Strand. In 2007 Thomas Walker completely redesigned the original layout and the Founders Club was created. This “ocean style” course has a unique coastal feel with its native grasses, wetlands, live oaks and towering pines. Waste areas and mounds make the course very challenging but the five sets of tees ensures that golfers of all levels will enjoy this outstanding Myrtle Beach golf course. The Founders Club was named Myrtle Beach Golf Course of the Year 2011 by the Myrtle beach Golf Course Owners Association as well as being deemed One of the 30 Best Golf Courses You Can Play in South Carolina by the South Carolina Golf Course Ratings Panel. The Founders Club of Pawleys Island should be a must play on your next Myrtle Beach golf vacation. The Myrtle Beach area has so much to offer visitors on their South Carolina vacation. We have great Myrtle Beach weather that makes visiting the many Myrtle Beach area attractions memorable. Don’t forget to check out the world class Myrtle Beach nightlife, Myrtle Beach restaurants and Myrtle Beach theatres. It is time to make your plans for next Myrtle Beach golf package.